おすすめの映画 - must see films! There are loads of great films due to open this month in <?xml:namespace prefix = st1 ns = "urn:schemas-microsoft-com:office:smarttags" />Japan. I can’t wait to see the new 007 film. Two parts Che Guevara films look great, too! But the film I’ve been looking forward so much since its opening in the UK last August is “Mamma Mia!”. As you probably know, it is a musical based on the songs of ABBA. 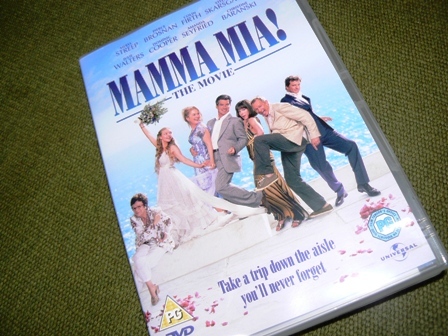 I saw a theatre production of “Mamma Mia!” in London many years ago. The film has become a massive worldwide hit since its opening last year. And I think it will be the same here once it opens on 30th January. I couldn’t wait until 30th January, so I obtained a DVD from the UK and have already watched the film, well, several times! The film didn’t disappoint me one bit and it is absolutely fantastic!!! These actors and actresses can all sing and dance! Anyway, if you want to blow the winter blues away, this is the film to see. And if you are like me, you can’t help singing along to the great ABBA numbers at the top of your voice.